The quiet contemplation of a voracious bibliophile. Alexa Zimmerman wonders if the Old Order Mennonite community in Arborville, Kansas will ever fully accept her. Her family roots here aren't what anyone thought when she first arrived, but she is hopeful that her culinary and hospitality skills will win the skeptics over. The bed-and-breakfast she’s operating needs to succeed so Alexa agrees to allow Briley Forrester, the hotshot reporter from Chicago, to stay as a long-term boarder not knowing his real motives for being amongst the Plain folk. Kim Vogel Sawyer is a best-selling author highly acclaimed for her gentle stories of hope. More than one million copies of her books are currently in print and have garnered awards including the ACFW Carol Award, the Inspirational Readers Choice Award, and the Gayle Wilson Award of Excellence. Kim lives in central Kansas, with husband Don and their four feline companions. She enjoys spending time with her three daughters and ten grandchildren. 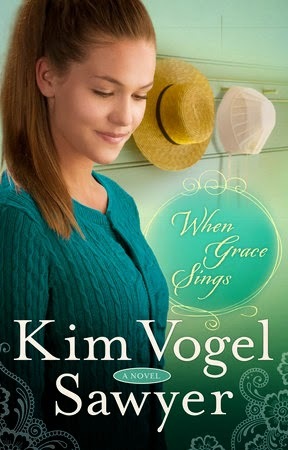 I think When Grace Sings is the first book I have read by Kim Vogel Sawyer, and I thoroughly enjoyed it! The plot line is strong and the characters are well developed. When Alexa discovers that Anna-Grace is coming to stay she is a little unsure of the idea, and feels somewhat put out by the interloper. Added to the tension is the arrival of the big city reporter who has been sent to write a story about the small Mennonite community in which Alexa and her family live. The interactions between all of the characters made for an interesting read, fun yet full of emotion. I thought the back story of the two girls was intriguing, and look forward to reading the rest of the series. Equally intriguing is the story of Briley, the reporter sent to sniff out the dirt on the Old Order Mennonite community that is Alexa's home. Is there any "dirt" to be found in the Old Order Mennonite community that Briley has been sent to? Will the people trust him enough to "spill the beans"? Why is Alexa so worked up about Anna-Grace coming to stay, and so standoffish when she arrives? Click here to download an excerpt of When Grace Sings. I received an ebook from Blogging for Books for the purposes of a review, this review is my personal view and is not required to be positive. I may receive a commission for purchases made through these links. G'day! I'm Michelle and I live in beautiful Western Australia. I grew up on a farm in the Wheatbelt and moved to the city with my family when I was 20. I can now attest to the fact that I have lived in the city longer than I ever lived on the farm, but still very much consider myself to be a 'country girl'. I guess you can take the girl out of the country, but you can't take the country out of the girl. You can also find me at my other blog - Michelle Marie.